The Rwaza FXB Village (north-west Rwanda) opened in April 2015. It is home to 80 families – a total of 542 people, including 307 children and 235 adults. These families include 41 headed by single women and 3 made up entirely of orphaned children. 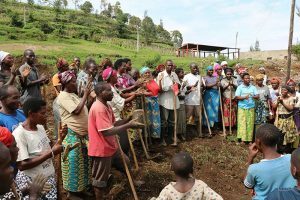 The people of Rwaza, who have long been victims of war and massive population movements in this area close to the DRC border, live in extreme poverty. 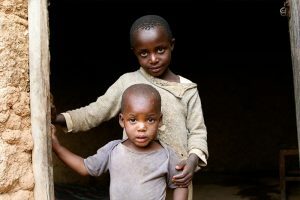 They have to face a number of problems, including lack of access to drinking water and sanitation, food insecurity, high HIV infection rates, a lack of funds for educating their children, and more. In addition, the community of Rwaza is known for having the largest number of abandoned mothers who are forced to turn to prostitution to raise their children. As a result, 182 children receive support at primary level, 55 are at secondary school, and 38 young people are following professional training courses. HIV/AIDS prevention and screening are important aspects of the FXB methodology.. When participants were chosen, only 184 people took an HIV/AIDS test. Sadly, at this stage of the program, 25 people – including 3 children – have been diagnosed HIV-positive. At 13.6%, this rate is extremely high when compared to the national average of 3%. The aim of this program is to bring these 80 families to economic and social autonomy in three years. 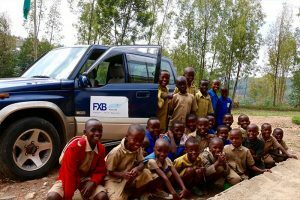 FXB is not a charity. Through its development and social enterprise work, it helps to build the skills of every single participant in its programs, enabling them to live in dignity from their work. 182 children receive support at primary level, 55 are at secondary school, and 38 young people are following professional training courses.